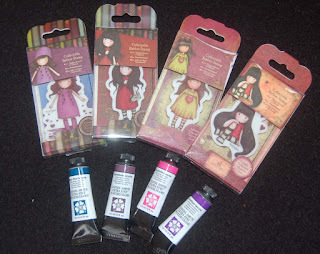 I wanted to play with the new Santoro stamps and Daniel Smith watercolor paints I purchased at HM Ben Franklin Crafts. Since I also bought an X-cut embossing folder with a heart pattern, I thought a Valentinish greeting card would be a good starting point. Beginning with watercolors sponged onto the indented side of the embossing folder, I placed a lightly water misted watercolor paper in the folder and ran it through my Big Shot machine. It was a little more difficult to apply the watercolor paint to the slippery surface of the embossing folder than when I used stamping ink but the blended watercoor-look was very attractive. I think the embossed white hearts look like cobblestones upon which the foam dot adhered image (fussy cut with patterned Pebbles paper pieced on for the clothing) is carefully walking on. There are lots of adorable Santoro stamps (only $3.99!) to choose from but I am showing only the ones with hearts. There are also many tubes of Daniel Smith watercolor paints at BFC. Shown here are only four of the 'genuine' colors I used on this card. The word 'cherish' was made with a Paper Smooches die and the 'i' was dotted with a Dress It Up mini heart button. For the inside of the card (not photographed) I stamped the Hero Arts words, 'Every day with you is a gift'. I used Hero Arts ombre blue, purple, pink ink pad and I think the script and colors match really well with the front of the card. Okay, that's it for now...please visit again to see another card I made using the same technique. Leave a comment if you have some time....love hearing from everyone. 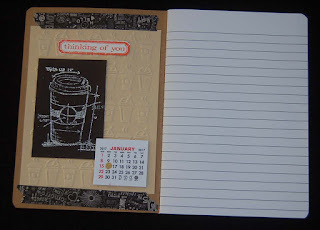 I used the coffee cup embosser to make the beige cover page and added the diagrammed coffee cup, thinking of you label, a mini calendar and washi tape. 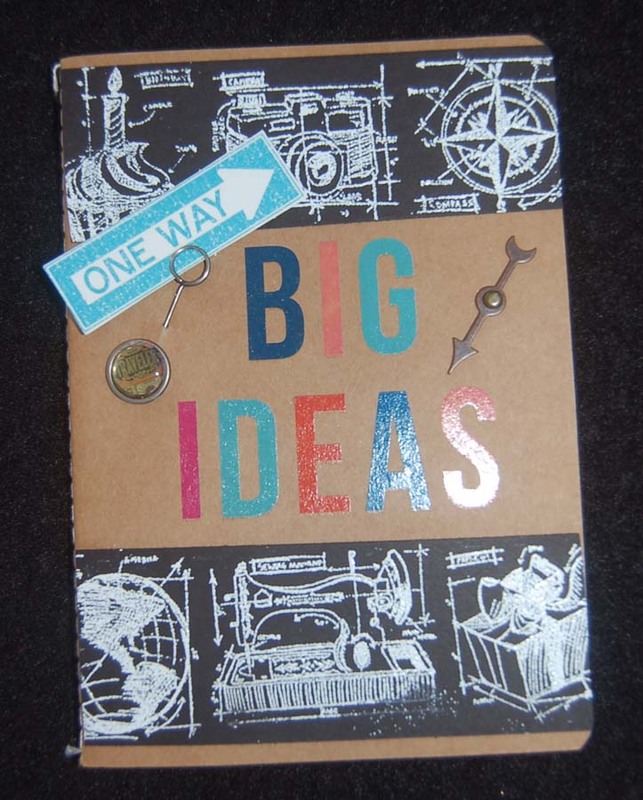 It was fun and easy creating this notebook. 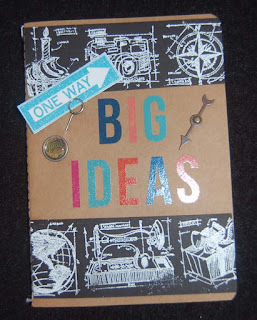 I plan to make many more using some of the other pretty choices of Studio G notebooks at HM Ben Franklin Crafts. Hope you'll do lots of crafty shopping at BFC in 2017! Here is the second birthday card I made for my dear hubby. We eat a lot at Panda's and always get fortune cookies. My husband saves the fortunes (even the junk ones) in a jar. Why? I honestly don't know. We now have a large mayo jar filled to the brim with fortunes . . . hehehe! Anyway, when searching for some other supplies, I 'found' this Lawn Fawn stamp set in my collection and it was still uninked! 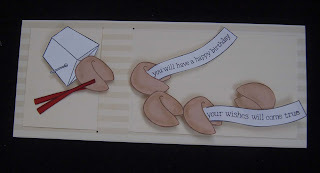 Because of his habit of collecting fortunes (paper ones), I knew I could make an appropriate birthday card for my husband. 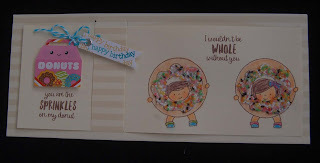 It was easy to stamp the cookies on light brown card stock with brown ink and add brown chalk to give it some dimension. 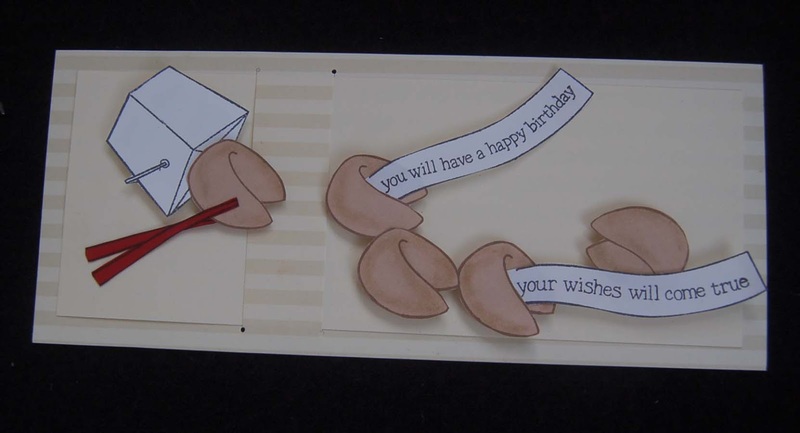 I glued the fortunes into the cookies and used foam stickers to raise all the pieces off the main card. I left the fortunes unglued so they would be just like the real ones you get in the cookies. 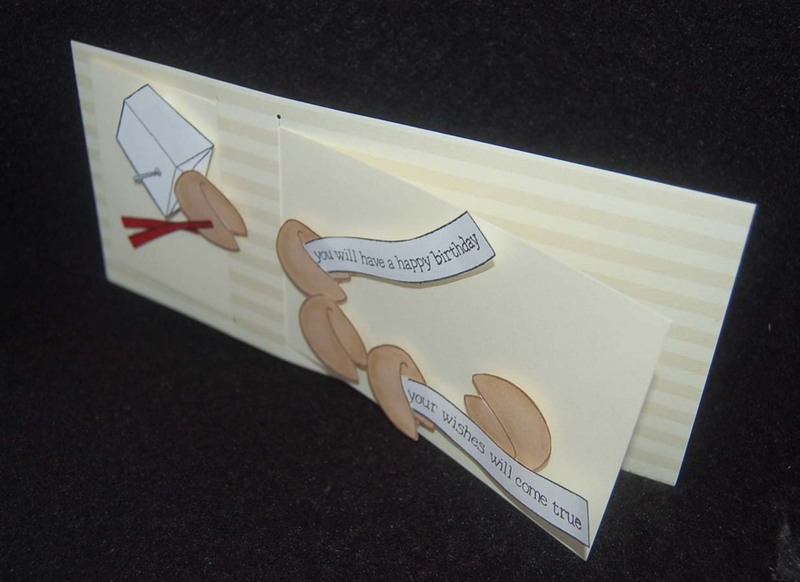 As with the card on my last post, this one also has a space on the striped card for a birthday message. 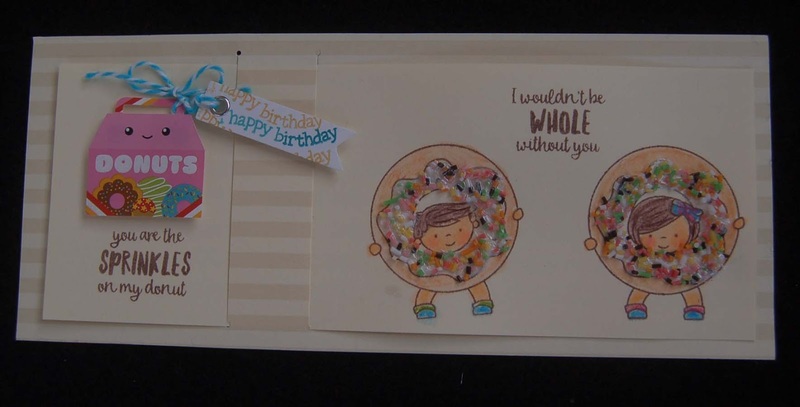 I think I'll give my man the donut card this year and save this one for next year....hmmm, maybe I'll do the opposite...still can't decide! Today is my husband's (?th) birthday! Happy Birthday Sweetie! I wanted to make him a card with a different format because he is unique; his card should be too! 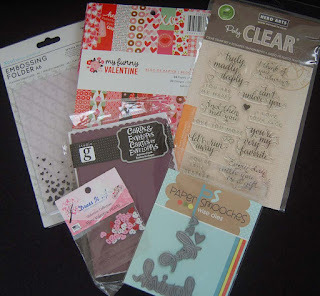 While moving (not cleaning up) my craft supplies I came upon several boxes of Making Memories long card blanks. 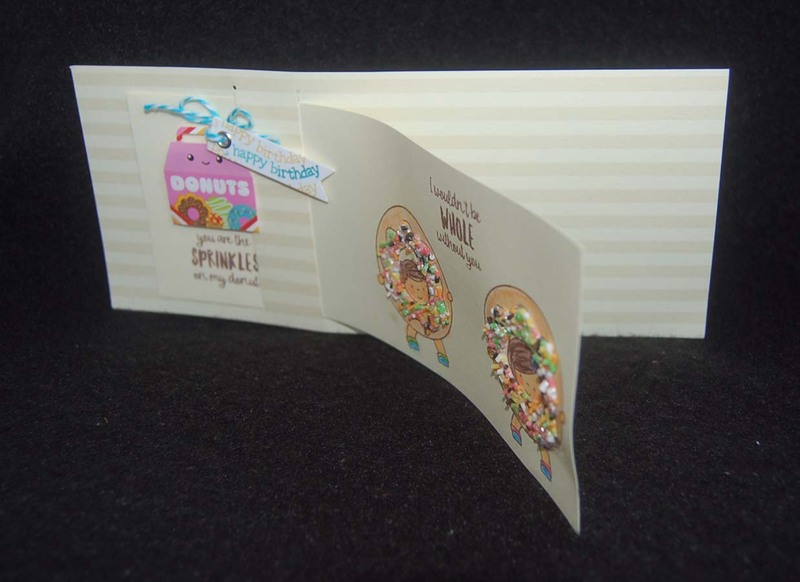 These cards were sold at BFC years ago, but you can easily make your own by cutting two slits in a striped card stock and slipping a solid card stock piece (slightly smaller than the striped one) into the band. 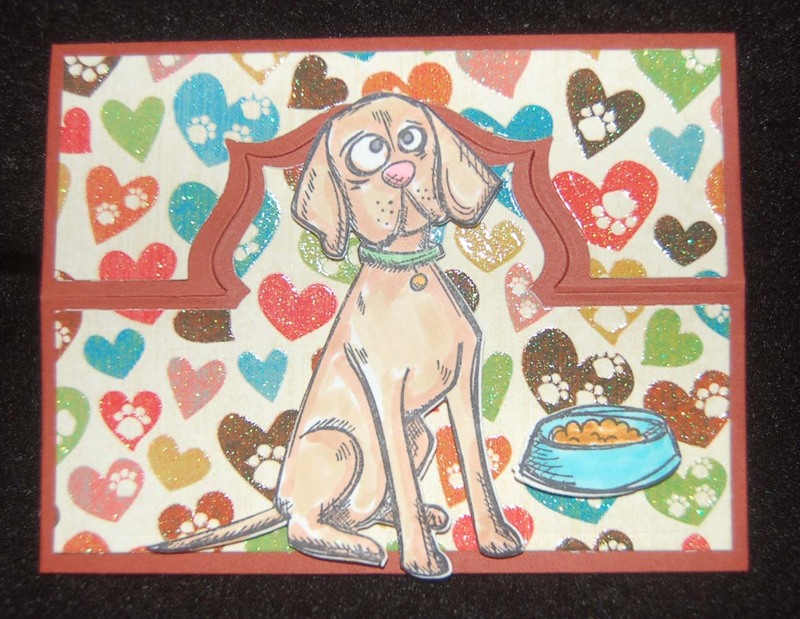 It was easy work to stamp the images and words onto the solid card blank. Then I colored the donut kids in with watercolor pencils and applied Bo Bunny 'Sugar' pearlescent paint (in tube) as frosting, sprinkling it with some fake candy decors. I turned the Sticko donut box sticker into a dimensional element by adhering pop-up foam stickers and then dusting the donut box sticker with cornstarch before removing the foam sticker backings. This photo shows where I will write my message to the 'birthday boy'. 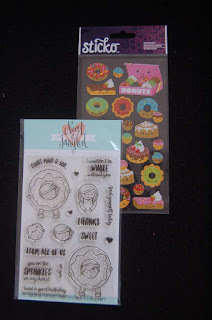 Oh yes, the stamps are from Neat and Tangled. I only now realize that the 'extra' heads are supposed to be popped up over the other heads in the doughnuts, oh well, next time. Thanks for visiting this blog....hope it was an enjoyable visit Please return soon to see the other birthday card I made for my husband.....can't decide which one to give him....HELP! Hope you've all recovered from your New Year's celebrations. Happy 2017! Okay, time to craft those thank you notes and Valentine's Day cards. 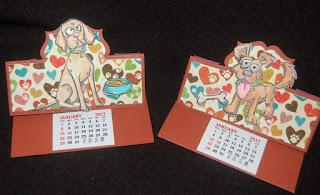 Here I've combined them with calendars for the new year. 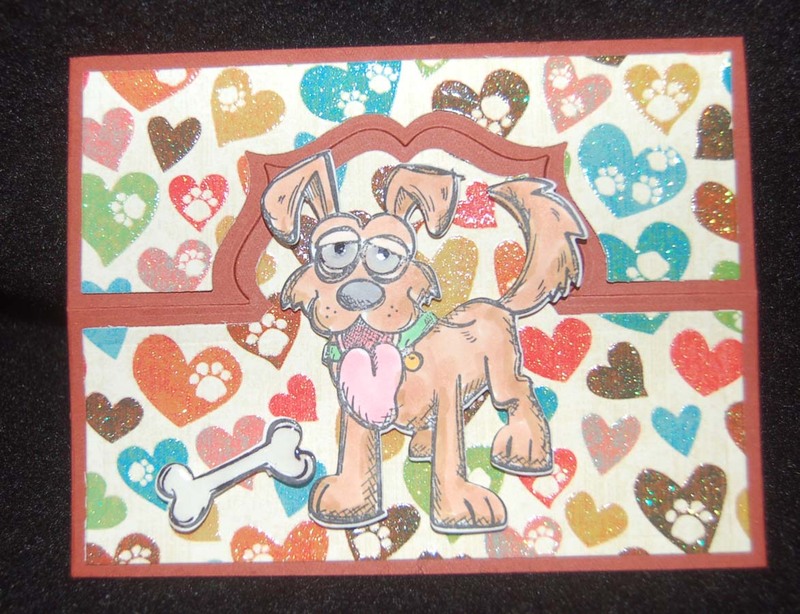 This is a close up of a dog image (which looks amazingly like our friends' dog, Charlie) from a Tim Holtz Sizzix stamp set. 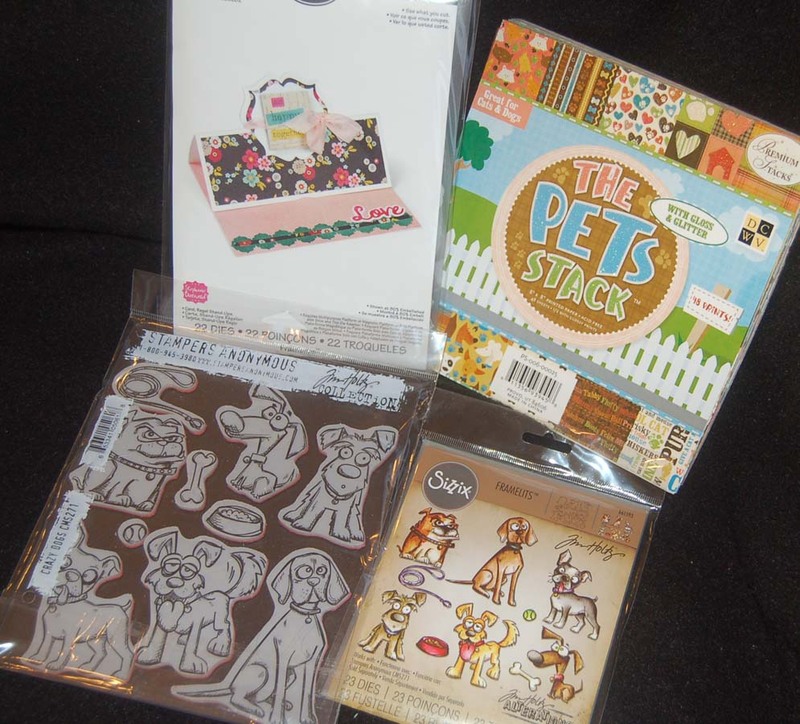 HM Ben Franklin Crafts is currently selling the large dog stamps and the matching dies. I love that the dies cut really close to the image so it looks like you hand cut them out. I secure the dies with washi tape over the stamped images to be sure they don't shift while running them through my Big Shot machine. 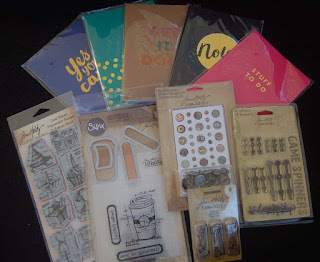 The Sizzix die set makes it really easy to cut out the stand up card blank and coordinating parts. 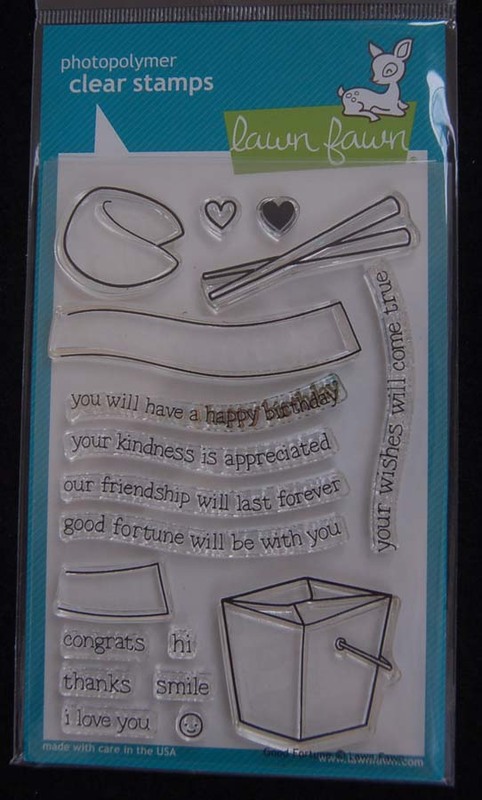 There are lots more dies (in the set) to use to decorate the card blank. This view shows how the cards stand up easily and are held in place by the tab in front of the calendar. I purchased the calendars online from Vippies (sold in various sizes). In my next post I will show the cat version of this card. Please visit again and leave a comment if you can....love hearing from you! 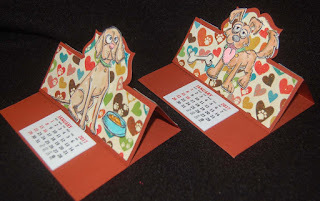 As with the previous dog cards, I tried to match the cats with their owners. This thank you calendar card is going to the owners of two grey sister cats who can often be found cuddling and napping together. The cat images of the cats on the left card are from a Neat and Tangled set that also had the words, 'purfect together'. which I heat embossed with gold powder. When the card is opened and propped up on the tab above the calendar, it makes a nice year-round display. 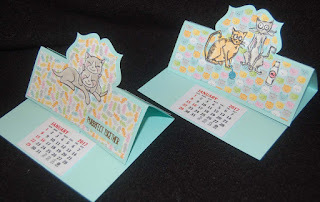 The cat calendar card with the startled cat images are for another cat loving family. The Sizzix die and stamp sets have both cats and dogs in a smaller version than the large dog stamp and die sets that I previously posted. 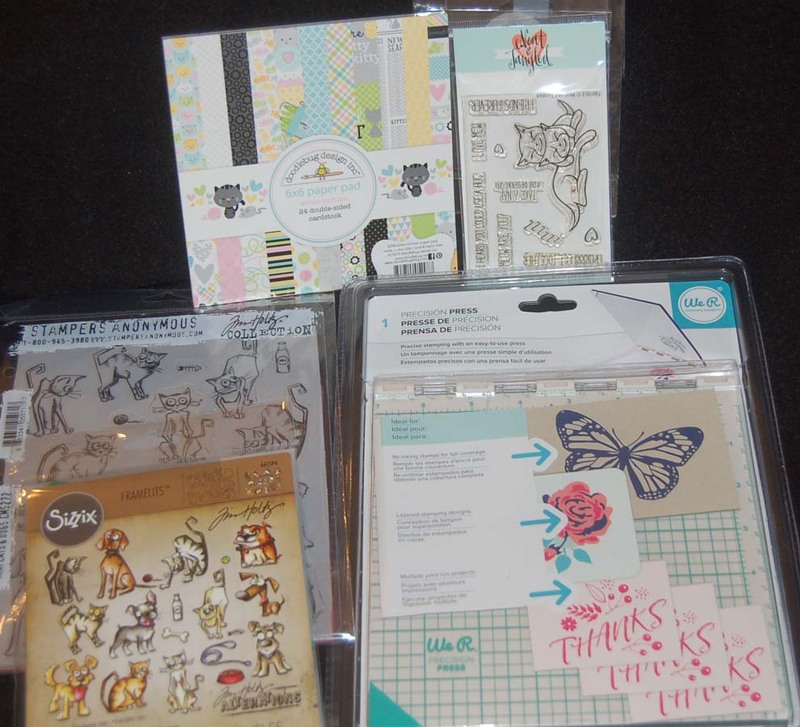 HM Ben Franklin Crafts has many of the Tim Holtz animal stamps and dies...check them out!....so cute! The adorable cat printed papers are from a Doodlebug 6x6 paper pad. 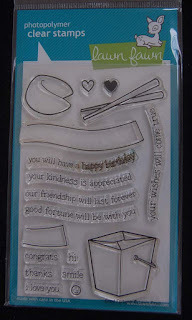 Also shown in the photo below is a new stamp alignment tool by WeR memory keepers. HM Ben Franklin Crafts will be selling this tool which is similar to the Misti stamping tool that we sold earlier in the year. Both tools are equally satisfying to use and truly make stamping more precise and flawlessly repeatable. 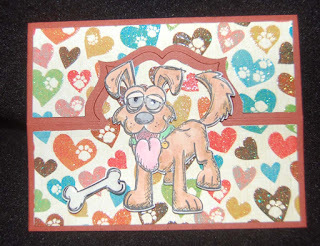 Please return soon to see the sweet Valentine cards I will be crafting in the next few weeks.